It’s a tool to get a grip on your deliverable assignments. It guides your time management. 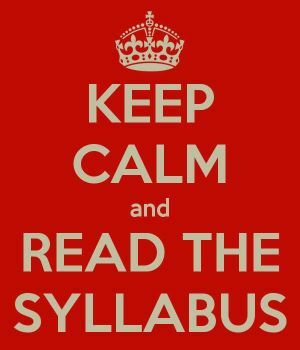 How does the Syllabus Reduce Stress??? Build your assignment work back schedules (see below). Plan out your reading/lecture note requirements week by week (check out this blog on organizing your week). Book your labs or writing centre times early, so they fit around your schedule. Lay out your Midterm and Final Exam long term study plan and avoid the last-minute cram fest. Stress and preparation have an inverse relationship. The more prepared you are, the less stress you have. I do a full-term layout, so I can see what courses and assignments train wreck over other courses and assignments. It takes a bit of prep time, but having a term plan let me take a two-day road trip to Montreal to see Radiohead and still hand in a final assignment on time without stressing. What else does the Syllabus do? It gives you an idea of the professor’s approach to the course and material. How is the course arranged? Some profs front load courses to help students avoid the last minute end of term insanity. Some profs arrange smaller assignments that build to a large final assignment reflecting course concept building over the term. Other profs balance the workload evenly. It guides how to proportion your time and prioritize assignments by grade weight. The syllabus and timeline make a formidable team. As soon as you get your hands on it read it. Then read it again.